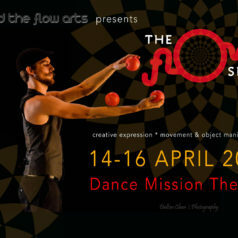 The Flow Show returns to Dance Mission Theater for its 9th year in the heart of San Francisco’s vibrant Mission District on April 14, 15 and 16, 2017. Packed to the gills with talent, imagination, and mind-blowing feats, this showcase highlights the Flow Arts, a combination of dance, creative movement, and skill props, that range from poi to juggling balls to hula hoops. Don’t miss the chance to see a refreshing cast of new and professional flow artists rock the stage, and take you on a creative journey through the flow arts. Do you mind if I quote a few of your articles as long as I provide credit and sources back to your webpage? My blog is in the exact same niche as yours and my visitors would certainly benefit from some of the information you present here. Please let me know if this ok with you. Appreciate it! My brother recommended I may like this web site. He used to be entirely right. This put up actually made my day. You can not imagine simply how much time I had spent for this information! Thanks!